Is this the last Porsche 997 we’ll see? 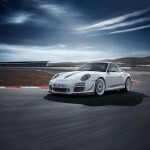 The much anticipated and prematurely leaked Porsche 911 GT3 RS 4.0 was officially launched today. The limited edition Porsche features the largest engine ever offered in a Porsche and is limited to 600 cars worldwide. The complete details are in the official Porsche press release at the end of this post. However, the video below is much more entertaining. 🙂 While Porsche is great at putting out limited editions, it's very possible that this new GT3 RS 4.0 is the last of the 997s we'll see. If you're viewing this post via your email subscription you may need to visit the site by clicking on Porsche 911 GT3 RS 4.0 to view the video). The 911 GT3 RS, one of Porsche’s most popular, coveted and successful track-inspired production cars, has been given a final, thrilling injection of thoroughbred motorsport technology resulting in the 2011 Porsche 911 GT3 RS 4.0. Limited to 600 vehicles worldwide, the 911 GT3 RS 4.0 brings together in a sports car the attributes that have made the Porsche 911 GT3 a consistent winner on the race track. The motorsport-derived 4.0-liter engine, already the highest displacement 911 engine ever, also features the highest per-liter output -- 125 horsepower (hp) per liter -- from a naturally aspirated Porsche flat-six engine. The engine uses forged pistons, the connecting rods are fashioned from titanium, and the crankshaft has been lifted unchanged from the 911 GT3 RSR race car. It achieves its maximum power of 500 hp at 8,250 rpm. Maximum torque of 339 ft/lbs is reached at 5,750 rpm. The 911 GT3 RS 4.0 offers truly impressive performance, lapping the famed Nürburgring-Nordschleife in 7 minutes and 27 seconds. Available exclusively with a six-speed manual transmission, the 911 GT3 RS 4.0 sprints from 0 to 60 mph in only 3.8 seconds, and with its gearing designed for the race circuit it reaches the 124 mph mark on the race track in under 12 seconds. The 911 GT3 RS 4.0’s outstanding driving dynamics come from numerous, meticulously coordinated details. In addition to using suspension components typically encountered in motor racing, weight reduction is also of supreme importance. Equipped as standard with lightweight components such as light but strong carbon fiber sport bucket seats, carbon fiber front fenders and luggage compartment lid, and weight-optimized carpets, the two-seater’s ready-for-action weight is just 2,998 lbs with a full fuel tank. 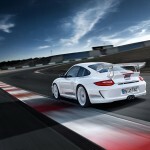 The 911 GT3 RS 4.0’s power-to-weight ratio is 5.99 lbs/hp. This limited edition 911 is painted Carrara White as standard and emphasizes its proximity to motor racing by its dynamic appearance. Signature characteristics are the wide track, the low vehicle position, the large rear wing with side plates, central twin tailpipe, and the aerodynamically optimized body. Air deflection vanes mounted on either side of the front bumper – called ‘flics’ or dive planes – make their first appearance on a production Porsche. They create increased downforce on the front axle, and together with the steeply inclined rear wing, provide aerodynamics on par with its performance capabilities. As a result, at the 193 mph top track speed, aerodynamic forces exert an additional 426 lbs of downforce, thus pushing the 911 GT3 RS 4.0 onto the road. With a manufacturer’s suggested retail price starting at $185,000 (excluding destination), the new Porsche 911 GT3 RS 4.0 goes on sale in the United States in late 2011.